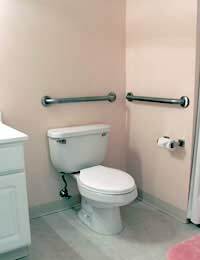 Every year around 88,000 of us suffer an injury in a home bathroom. A few safety measures could reduce the risk substantially – but it’s amazing how many of us neglect them. Do you know the right temperature to bathe children? Is your bathroom radio waterproof? How many out-of-date medicines are there in your cabinet? The ordinary family bathroom is awash with risks and safety hazards. Use our quick quiz to improve your family’s safety in the bathroom. Are Chemicals Stored out of Reach? Aproximately 30,000 people are taken to hospital with suspected poisoning each year - that's 2,000 per month. Out of this number, 25,000 are aged 4 or under. So if you have children in the house – yours or visiting – it’s very important to secure cupboards and cabinets that contain potential poison. RoSPA suggests installing at least one lockable cabinet for your medicine and cleaning products. You should also keep make-up, perfume, essential oils and hair dyes in this cupboard. Do you Date-Check your Medicines? It’s worth going through your medicine cabinet now and again; remove anything out-of-date, and take leftover prescription medicines to your local pharmacist, who will get rid of them safely. Make sure there are no loose tablets lying around and that everything is in a clearly-labelled container. You wouldn’t want to take the wrong medicine or accidentally consume out-of-date prescriptives. Do you use a Bath Seat for Children? Bath seats are designed to be used in your main bath for young children. Provided you’re supervising, a bath seat should be safe, but don’t be lulled into a false sense of security. New advice suggests that bath seats give parents the impression they can leave the room for a moment, but they do not prevent children from drowning. Approximately 5 children die every year in their bath. The design of a bath seat allows wriggling children to get out; if left alone for even a moment, they could drown swiftly and silently. Whether you use a bath seat or not, never, ever leave a child in a bath – even for a minute. Do you Keep a Radio in the Bathroom? If you keep a radio in your bathroom, choose a battery-operated, waterproof model. Don’t put a mains-operated radio – or any other appliance, including portable heaters and hairdryers – in the bathroom. If you’re having any rewiring done in this room, it’s important to use a qualified electrician. If you have a modern water boiler it might display the water temperature as it heats up. You can adjust this type of boiler to ensure that water coming out of taps is never scalding. If not, you could install a thermostatic mixing valve, which allows you to control water temperature at the taps. Be especially careful with children, who can turn on taps if you leave the room, and risk scalding themselves. For super-safe testing, buy a water thermometer and save burning your elbow on hot water. For children, water shouldn’t be hotter than 37 degrees celcius. Falling is a common accident in the home – and nobody is immune to it! When you next redesign your bathroom, consider including anti-slip features such as textured flooring; radiators with touch-safe surfaces; hand-rails around the bath, shower and toilet; and ‘in use’ signs instead of locks.